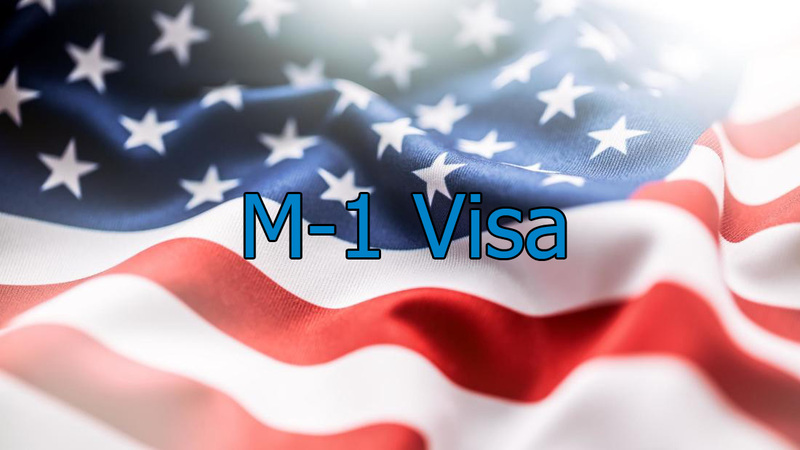 M-1 is a non-immigrant student visa, which allows foreign citizens to take a full course of study in non-academic programs or study during holidays in the United States. The M-1 visa is suitable for international students who wish to study in the United States during the holidays or take a non-academic course (except for language courses) at a college, university, or conservatory in the United States. Visa M-1 allows the student to stay in the country for a year, or for as long as he/she studies full-time, plus 30 days to leave the country. Students with an M-1 visa have the right to change their status to another category of temporary US visas. However, M-1 does not allow its holder to apply for a H1B or F1 visa, if the invitation to work is based on the knowledge gained by the student through training on an M-1 visa. apply for an M-2 visa for family members accompanying the holder of an M-1 visa. The M-2 visa is issued to the spouse / spouse and minor (under 21) children of the M-1 visa holder. The above dependents have the right to stay in the United States during the term of legal residence of the main holder of the visa. Note: after the expiration of 6 months from the moment of the beginning of studies, a student with an M-1 visa is not entitled to change the program for which he / she is studying, except for really exceptional circumstances. After graduation, a student with an M-1 visa may apply for an extension of his/her stay in the USA if he/she is going to undergo an internship in a field. As a rule, the status of M-1 will be extended at the rate of 1 month of practice for every 4 months of training. In this case, the total internship period may not exceed 6 months. To extend your stay in the United States, you need to send the completed I-539 form (application for extension or change of non-immigrant status) to the USCIS no later than 15 days (but not earlier than 60 days) before the time allowed for you to expire in USA. In addition, you must submit Form I-201D to the USCIS. Claudine Gasana is one of the best lawyers in Houston, Texas. We provide non-immigrant visa help for student visas such as M-1 Visa F-1, J-1 etc. Immigration Lawyers in Katy, Pasadena, The Woodlands, Cypress, Pearland, Sugar Land and more. Houston Immigration Lawyer Gasana has focused their practice on law applicable to family members of the green card holders or U.S. citizens, foreign skilled workers, U.S. employer and investor visa; waivers and deportation cases. Claudine Gasana is one of the Houston best immigration attorneys, Houston, TX top immigration lawyer in Houston. Her practice areas range from family green card solutions to a variety of non-immigrant work visas such as H1B, TN, F-1, and O-1 for legal cases in oil and gas, heathcare, higher education industries and more. Contact an experienced Houston Visa Lawyer or visit our immigration office today. The information on this website is for general purposes only. Nothing on this site should be taken as legal advice for any individual case or situation. The reader should consult with a Licensed Attorney prior to filing for any petition as each individual case may be different.